Warping a cat onto a leopard. Anatomy is shown schematically for illustration purposes. Ziva Anatomy Transfer assumes that you already have the “source” Ziva creature fully setup. Its geometry (tissue meshes, bone meshes, cloth meshes, etc.) must be available, as well as the Ziva rig (attachments, material properties, solver settings, muscle fibers, etc.). Given just the external mesh (the “skin”) of the target creature, ZAT can then warp the geometry, any skin clusters (such as on bone geometry), and the entire Ziva rig, from the source creature onto the target creature. The transferred creature can be optionally put into its own Ziva solver. From there, it can be saved to disk as a standalone creature, and/or simulated completely independently of the source creature. Note that the user will need to provide good motion (i.e., sequence of joint angles that define the creature’s animation) for the target creature. ZAT does not retarget the motion from the source joint hierarchy onto the target joint hierarchy. It can, however, transfer the joint hierarchy from the source creature onto the target creature; with the expectation that the joint hierarchy on the target creature may need to be manually adjusted, for example, to tweak joint orientations. ZAT can also transfer any skin clusters that you may be using, for example, to drive the bone geometry with your joint hierarchy. This is our general-purpose method to warp the geometry (such as creature anatomy) from the source creature onto the target creature. This deformer solves a harmonic problem in the domain enclosed by the source cage, mapping the source cage onto the target cage, and as such maximizes the smoothness of the warp. The user provides the skin meshes of the source and target creatures (source and target “cages”), as well as the source creature’s geometry (such as internal anatomy) to warp. This feature can warp Maya meshes, representing, for example, tissues (muscles) or cloth objects (fascia). It can also warp Maya joint hierarchies, locators (including their orientation), and Maya NURBS curves and surfaces. The “source cage” and “target cage” meshes must have the same number of vertices and must be closed. They define the volume in which the warp will be performed. The meshes to be warped must be inside the volume enclosed by the “source cage”. The output meshes will lie inside the volume enclosed by the “target cage”. The vertices of the “source cage” and “target cage” meshes must be in 1:1 correspondence and in the same order. Harmonic warp is constrained to map the “source cage” mesh onto the “target cage” mesh. Subject to this constraint, it creates a deformation field, inside the volume enclosed by “source cage”, that is spatially as smooth as possible. The zHarmonicWarp.surfacePenalty parameter controls the hardness of the constraint. The larger the value, the harder the constraint: the “source cage” mesh will warp closer to the “target cage”, with a higher chance of the warp being unstable. A tet mesh will be created internally. The tetSize parameter controls the resolution in Maya units. The smaller the value, the more precise the warp, but also the higher the resolution and the longer the computation time. In order to execute the harmonic warp, select, in this order, the source creature skin, target creature skin, and one or more meshes/NURBS objects/joints/locators to be warped. Running zHarmonicWarp with these objects selected will create a zHarmonicWarp deformer node that deforms the shape(s). -h   -help            <n/a>     This message. -t   -tetSize         <float>   Set the tet mesh size for the harmonic warp, in scene units. No tets will be larger than this value. tetSize is set to a tiny value. target cage. This value is given on a log scale, and can be negative, zero or positive. Smaller values increase the smoothness at the cost of the warp deviating more from the target cage. This is a specialized tool for warping Maya meshes that represent bones. In contrast to the harmonic warp, the bone warp keeps the bones straight and avoids distorting the boneheads’ geometry. The user provides the source and target cage meshes (such as the skin of the source and target creatures), the bone meshes to warp, and a landmark map. Landmarks are important anatomical features on the bone whose relative positions need to be preserved by the warp. The landmark map can be painted on the bone mesh interactively. A landmark is then placed automatically at the center of each “blob” (connected region with non-zero map values) of the painted landmark map. For each blob, the landmark position is computed as the average position of vertices in the blob, weighted with the painted vertex weights. Landmarks can be visualized by selecting the zBoneWarp node. For simple bones, it should be sufficient to paint a landmark map that results in two landmarks, one on each end of the bone (on the boneheads). For more complex bones such as the hip bone, multiple landmarks will likely be required to preserve the bone shape and prevent the bone from poking through the skin. You can paint the landmark map by right-clicking on the bone mesh, and entering the Paint menu. Two bone-warping landmarks computed from a landmark map on the humerus bone. Left and right images are two different views. Note that the “source cage” and “target cage” meshes must have the same number of vertices and must be closed. They define the volume in which the warp will be performed. The bone meshes to be warped must be inside the volume enclosed by the “source cage”, and the resulting output meshes will lie inside the volume enclosed by the “target cage”. The vertices of the “source cage” and “target cage” meshes must be in 1:1 correspondence and in the same order. The warping of each bone is controlled using a harmonic warp, and a special per-bone deformer that keeps the bones straight. The per-bone deformer is computed on a per-bone tet mesh; the tet mesh resolution is controlled by the boneTetMeshResolution parameter. The user can control the per-bone deformer by painting a landmark map onto the bone mesh. Each bone is warped by first warping its landmarks using the harmonic warp. 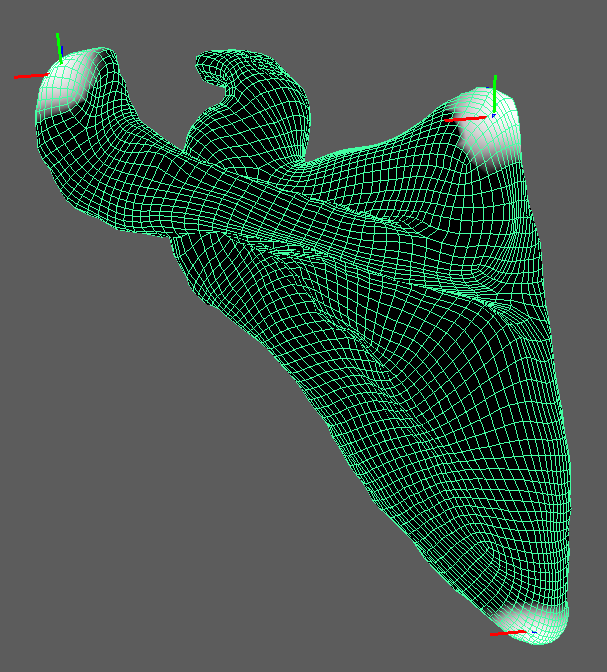 Then, the bone geometry is warped using a per-bone mesh deformation function defined by the landmarks. This ensures that the bones follow the landmarks, while remaining as straight as possible. Much like the harmonic warp, the bone warp solves a harmonic problem inside the volume occupied by the “source cage”. This mapping is constrained to map the “source cage” mesh onto the “target cage” mesh. Subject to this constraint, the command creates a deformation field inside the volume enclosed by “source cage” that is spatially as smooth as possible. Parameter zBoneWarp.surfacePenalty controls the hardness of the constraint. The larger the value, the harder the constraint: the “source cage” mesh will warp closer to the “target cage”, with a higher chance of the warp being unstable. A tet mesh will be created internally to perform the harmonic warp. The tetSize parameter controls the resolution in Maya units. The smaller the value, the more precise the warp, but also the higher the resolution and the longer the computation time. In order to execute the bone warp, select, in this order, the source creature skin, target creature skin, and one or more bone meshes to warp. Running zBoneWarp with these objects selected will create a zBoneWarp deformer node that deforms the bone shape(s). -h   -help                   <n/a>     This message. -t   -tetSize                <float>   Set the tet mesh size for the internally used harmonic warp, in scene units. No tets will be larger than this value. Same usage as in the zHarmonicWarp node. if tetSize is set to a tiny value. Same usage as in the zHarmonicWarp node. resolution of this tet mesh: the size of the tets is the width of the bone divided by this value. -i   -maxIterations          <int>     Maximum number of iterations used to compute the per-bone deformer (see below). This is a warp deformer that uses Radial Basis Functions (RBF). Compared to the harmonic warp, it does not explicitly maximize warp smoothness; however, it can warp geometry located outside of the creature. It can be used, for example, to warp geometry that is located externally of the creature’s skin, such as hair or eyebrows. This deformer can only warp Maya meshes. In order to execute the warp, select the source creature skin, target creature skin, and one or more meshes to warp. The “source cage” and “target cage” meshes must have the same number of vertices. The vertices of the “source cage” and “target cage” meshes must be in 1:1 correspondence and in the same order. The command automatically computes suitable kernel centers on the source cage. The RBF deformation field is computed so that each kernel center maps onto the corresponding location on the target cage. There is no requirement for the warped mesh to be inside the source cage, or that the cage meshes must be closed. The cage should typically have lower resolution (and different topology) than the warped mesh. In order to execute the warp, select, in this order, the source creature skin, target creature skin, and one or more meshes to warp. Running zRBFWarp with these objects selected will create a zRBFWarp deformer node that deforms the shape(s). -h  -help               <n/a>  This message. -k  -maxKernelCenters   <int>  Set the maximum number of kernel centers. Ziva Anatomy Transfer supports multiple operations to manage, copy and modify Ziva rigs. Internally, these operations are implemented using the zBuilder toolset. Loads a Ziva rig from a disk file, and applies it to the specified solver. Saves a Ziva rig in the select solver to a disk file. Only the Ziva rig in the selected solver is saved; rigs tied to other solvers are not saved. # Load a Ziva rig from a file. Geometry must already be in the scene. # If solverName is not provided, the rig is applied to the solver stored in the zBuilder file. # and apply the rig to that solver. # Save a Ziva rig to a file. # If there is only one solver in the scene, it is saved. # of selected solvers and the default solver. 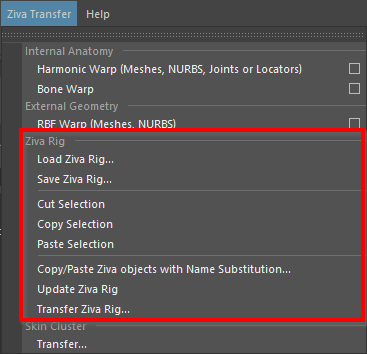 These commands make it possible to cut, copy and paste Ziva rigs. You can cut, copy and paste individual simulation bodies, or an entire solver. You can cut/copy/paste Ziva rigs from within the same creature, or from a creature onto a new creature. For example, suppose you already rigged a part of the creature. Suppose you want to rig additional geometry that has the same number of mesh vertices and triangle connectivity (but not same vertex positions) as the already rigged objects. Then you can select those already rigged objects, copy them, and paste their Ziva rigs onto this previously un-rigged additional geometry. Note that for copying an entire Ziva rig of a creature onto a “clean” un-rigged creature, either into the same solver or into a separate solver, you can also use the zRigTransfer script (Transfer Ziva rig to a different solver). # Cut the Ziva rig available on currently selected objects, into the Ziva clipboard. # Selection cannot be empty; otherwise error is reported. # (it does not matter if the solver node is a solver transform node, or solver shape node). # The selected objects must all come from exactly one solver; otherwise error is reported. # The unique solver stored in the Ziva clipboard is referred to as the "Ziva clipboard solver". # Copy the Ziva rig available on currently selected objects, into the Ziva clipboard. # Same usage notes as with zRigCut. # Paste the Ziva rig from the Ziva clipboard onto scene geometry. # the Ziva rig is applied to scene geometry that is named inside the Ziva clipboard. #   source selection 2 is pasted onto target selection 2; and so on. # The pasted Ziva rig is stored into the Ziva clipboard solver. You can learn more about regular expressions at the Regex101 website. # Copy/Pastes Ziva rig for the selected solver, using regular expressions. # If multiple solvers are selected, only the first solver is processed. This command updates the Ziva rig in the selected solver to use the current geometry. This is useful if you made modifications to creature’s geometry after you converted it into Ziva simulation bodies. In this way, the Ziva rig is identical to a Ziva rig that you would obtain if the current geometry was actually used to make the Ziva simulation bodies directly. This feature is also useful if you warped a creature using one of our warping tools, and you want to update the Ziva rig to use the newly warped geometry. # Updates the Ziva rig in the solver(s). # built Ziva rig on the modified geometry. # If "solvers" is not provided, they are inferred from selection. Suppose you have a fully setup source Ziva creature with both the geometry and Ziva rig, and a target creature for which you have the geometry, but no Ziva rig. Suppose the target geometry has the same connectivity but different vertex positions than the source geometry. This is the case, for example, when the target creature geometry was obtained by warping the source creature geometry using ZAT. In this case, this feature makes it possible to transfer the Ziva rig from the source geometry onto the target geometry. The transferred rig is made available in whatever solver chosen by the user. A common choice is to make it available in its own separate solver, so that the target creature is completely independent of the source creature. After transferring the rig, the new Ziva rig on the target creature can be saved to disk using Load/save a Ziva rig. Optionally, the source creature and its solver can also be removed from the scene, using the Ziva->Remove->Selected Solver(s) command, leaving a scene that has just the target creature in it. In order to warp the Ziva rig, you will need to provide the source and target solvers (in the dialog box). # Transfers the Ziva rig from 'sourceSolver' to another solver (targetSolver). # This command does not transfer the geometry. It assumes that a copy of the geometry from sourceSolver is already available in the scene, prefixed by "prefix" (without the quotes). #   then this command assumes that there is a mesh called "warped_tissue1" in the scene. # The command generates a Ziva rig on the 'warped_*' geometry in the targetSolver. # If targetSolver is "", the command sets the targetSolver to sourceSolver + prefix. # If targetSolver does not exist yet, the command generates it. # Note that the targetSolver may be the same as the sourceSolver, in which case the rig on the 'warped_*' geometry is added into the sourceSolver. Suppose you have a fully setup Ziva creature. This creature likely has some Maya skin clusters that are used to drive the bone meshes based on the joint hierarchy motion. Suppose you have already transferred the bone meshes, and the joint hierarchy, onto a new creature (“target creature”). This feature makes it possible to transfer the skin clusters onto the meshes of the target creature. It does so by copying the skin cluster weights from source meshes to the target meshes, and by connecting the target meshes to the target joint hierarchy. In order to execute this function, select the Maya mesh that contain a skin cluster that you want to transfer. Then, execute the Ziva Transfer->Skin Cluster->Transfer command. This command assumes that both the mesh geometry and the joint hierarchy driving it have already been warped, and are prefixed with “prefix” (without the quotes). # and connect the warped mesh(es) to the warped joint hierarchy. # Both geometries must have the same topology. The names of the warped meshes must be prefixed with prefix. # skin cluster(s), have already been warped, and are prefixed with "prefix" (without the quotes).